Occasionally birds and squirrels will find seed balls irresistible. If you live in an area where these kinds of creatures are accustomed to nut or song-bird-egg-sized objects on the ground that have food in them, they will definitely notice the seed balls. Corvids, especially, since they are curious and intelligent and are always on the look out for an easy meal. There are a few things that can be done. Some report that chili powder mixed in the seed ball or rubbed on the surface will prevent rodents from foraging. This would be ineffective on birds, who are insensitive to that chemistry. Covering them in leaves, clippings, or nestling them in the thatch or duff can help considerably. If there are corvids watching you, they will investigate what you are doing, no matter how well you camouflage the seed balls. Make certain – to the best of your ability – that there are none around (see Bernd Heinrich, Mind of the Raven, if this sounds interesting). You can, of course, bury the seed balls, but that kind of defeats the point. Plant them sparingly. 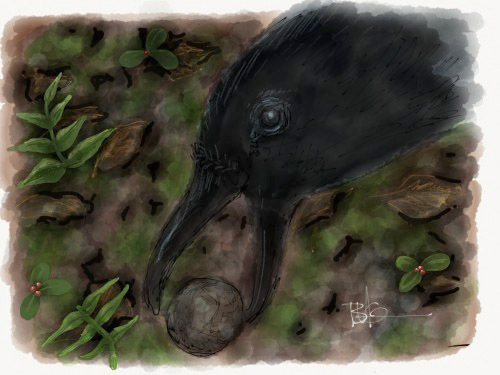 If you toss a bunch of conspicuous egg or nut like things on your lawn, you’ll get crows, ravens, magpies, jays, whatever birds of that ilk you have around. If you deposit them sparingly, they will be a less attractive curiosity. My son once left a bunch of ping pong balls in our back yard. The next day, every one had a crow-bill sized hole in it where the disappointed bird had attempted to extract a yolk. Making your seed balls tough by adding fibrous material and thoroughly drying them will make harder to extract the seeds. By using only 1-2 seeds in them, there isn’t a substantial food reward for the effort, so you may only loose one or two seed balls while the critters learn that they are not worth their effort. Supplying them with an alternative easier food source, a “low hanging fruit” nearby, they may ignore the seed balls in favor of the obvious goodies (sunflower or safflower seeds will please a wode variety of corvids. Unsalted peanuts in their shell are a favorite. the birds will come to learn that the seed ball is less attractive as food. Just some thoughts. In the seed ball, your seed remains far better off then lying naked on the land. An in-depth discussion about birds and seed balls is here: Seed Bombs and Birds.